We did all the hard work for you – tested dozens of providers that we thought were suitable for hosting Odoo on, and we compared the best here. It all depends on your needs, but some hosting providers are universally “good for Odoo”, and others are not. We’ll try to be as detailed as possible. Best hosting for Odoo if you know what you are doing – Vultr. Best hosting if you are a beginner – LinuxFox. Best hosting for enterprises – SolaDrive. These can be your guidelines when choosing a hosting provider for Odoo. The hosting plan must meet all these requirements. Some “must-haves” are Python and PostgreSQL. 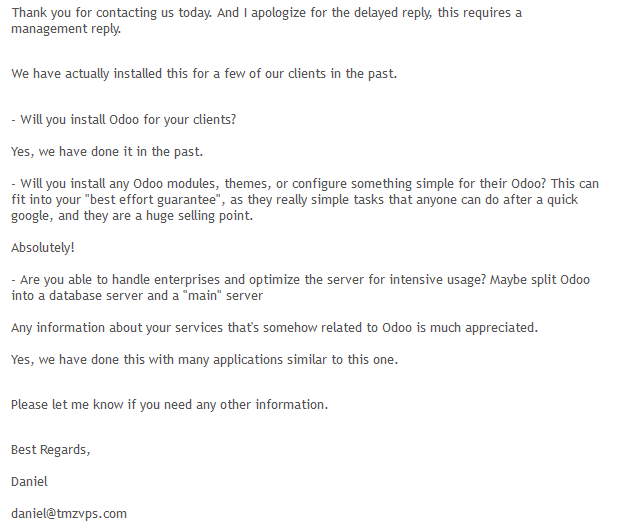 Which is the main reason why Odoo doesn’t run on shared hosting. There are other software requirements too, depending on what features of Odoo you want to use. But consult your hosting provider or the tutorial you’re following for other software dependencies. As for actual server specs, we categorized them into 3 categories. There are no official requirements or guidelines from Odoo. We came to these results by testing and benchmarking some cloud servers for us and our clients. So obviously, you can even use Odoo on a 1GB RAM VPS with a single CPU core, but the performance will be terrible. When 10-50 users start using the Odoo, you should look at some bigger server plans. One thing to note is that you don’t have to strictly follow these requirements. So if you had 11 users, you could easily fit them into the minimal requirements plan. This is the minimum. You should always get a better plan if you can. Especially if you’re an enterprise and can afford a slightly more expensive hosting plan. So based on our requirements and guidelines, there are quite a few hosting providers that will meet those requirements. However, we’d split the hosting providers into 2 categories: managed and unmanaged. You should get a managed server provider if you are a beginner, and don’t have anyone at your company that can install and manage Odoo on your server. By using a managed server, you can let your hosting provider install Odoo for you, monitor your servers, optimize them etc. You should get an unmanaged server if you are an expert and know what you are doing. So you are expected to configure the server itself, secure it, monitor it, maintain it, install Odoo, optimize it, and basically do everything on the server yourself. An alternative is to get an unmanaged server and a cheap server maintenance plan from a server management company. So let’s start with the managed providers. There aren’t many quality managed server providers to choose from, but the following are the best ones you can find for Odoo. We listed plans that would (almost) meet the minimum requirement for Odoo so the comparison works better, but they obviously have larger plans more suitable for higher requirements. Host4Geeks just introduced their new managed Odoo hosting plans. They are an Odoo partner with a technical support team experienced in Odoo. They’ll manage both your Odoo and your server. Use coupon code “THISHOSTROCKS10” to get 10% off your order. We’d like to single out SolaDrive in our managed Odoo hosting providers list. They are a great fit because they will install Odoo for you, optimize your server, and they have high-availability setups available. Meaning that they can “split” your Odoo into two servers. They speciailze in enterprise solutions. If you’re looking for the most support for Odoo that you can get from a managed VPS provider, then go with SolaDrive. We have an exclusive 35% lifetime discount for SolaDrive. Another alternative of SolaDrive that provides a similar level of services for Odoo is LinuxFox. They will install Odoo for you, third-party add-ons, set up fail-over solutions and much more. We also have an exclusive coupon for LinuxFox. If you’re looking for a simple, small-business managed solution, you can use KnownHost. They are known for their great technical support. You can get a 15% lifetime discount for KnownHost. LiquidWeb are a safe choice – they are the most popular fully managed provider. We recommend LW if you decide to use a dedicated server. They have great 24/7 support and a “best effort guarantee” for any Odoo management. Get 50% off your first 3 months when using a LiquidWeb Cloud VPS. Now let’s compare the unmanaged cloud hosting providers for Odoo. They are noticeably cheaper, at least compared to Managed providers, but you won’t get any support from the hosting provider. An alternative is to get an unmanaged hosting plan, and then buy server management services that will manage your servers, or contact them to install Odoo for you. We only compared plans that (almost) meet the minimum requirements for Odoo. These hosting plans are easily scalable (with a couple of clicks) and they have a wide range of options for resource-intensive applications. In other words, they also have plans that would meet the high requirements of an enterprise-level Odoo. If you still can’t decide and had to choose one, we recommend getting a hosting plan from Vultr. Do you use any of these hosting providers? What do you use for hosting Odoo? Feel free to leave a comment below, and please include information such as how many users the Odoo has, what kind of a server it is (RAM, CPU) etc. We are running 30 different instances(100s of users at a time) in odoo and takes up to a memory of 80 GB. (This stats are going to increase considerably) . Currently using OVH SAT server, 2TB Storage. But it appears to slow down in recent times when the usage was increasing. Planning to change the server host and upgrade to SSD for better performance efficiency, which will be the most reliable one? I plan to use Docker containers in our Odoo deployment. We are in prototype stage and less than 10 users. Any recommendations? For a prototype with 10 users and Docker I’d recommend Vultr. You can get $50 free credits too https://thishosting.rocks/vultr-coupons-free-credits/ . A 2GB RAM server should be fine. You can upgrade later if needed. Does anyone know of any good US based Odoo Developers trainers which are not $100+ an hour? Next post Free Managed VPS/Cloud Server Giveaway!